The Beaver Builder Theme supports several different header styles with a variety of styling options. A navigation menu, which in some header layouts is part of the main header area, or in others is styled as a separate area, as shown in the following screenshot. See the Related Articles on where menu colors come from and additional screenshots of header layout types in the following sections. Troubleshooting tip: Beaver Themer Header-type layouts override these Customizer settings on the pages to which they apply. If you have the Beaver Themer plugin installed and your Customizer settings don't seem to be working, check to see if there is a Themer Header layout applied to that page. You can optionally enable a top bar strip above your header with up to two columns of content. It’s a great place for quick messages or social icons. If you select Text for either column, you can enter HTML in the content areas, such as links to email addresses, heading tags, or even a small image. If you select Social icons, configure the icons at Customize > General > Social links. See the Related Articles for more information. If you enable just one column, the content is centered. If you enable two columns, the left column is left-justified and the right column is right-justified at larger screen sizes. As the screen is sized smaller, the two columns become stacked and centered. The maximum width of the content is controlled by the Content width setting in Customize > General > Layout. See the Related Articles for more information. A background color or image in the top bar, with all the usual settings for positioning and sizing the background image. Top bar text font color, link color, and hover color. Header layout settings apply to both the main header and menu areas, not the top bar. We'll cover the options one by one. There are several layout choices. The header and menu are not displayed when the page first loads. The top bar remains visible if it is enabled. If you set the Fixed header field to Fade in, a header with the site title on the left and menu on the right will appear when you start scrolling the page on large screens only. On medium and small screens, the header remains hidden. See this article for the CSS code to display the header but hide the nav menu. Menu items appear below the header. The site title (or header logo) and the menu are left-aligned. Here's the default Nav Bottom layout on medium devices, with the same settings. And here's the default mobile layout with the same settings. Either the Menu button or the hamburger icon will appear, depending on your setting in Customize > Header > Nav Layout > Responsive nav toggle. Vertical space in the top and bottom of the header area. Disabled by default, or you can choose a type of fixed header. See the article about fixed header types for details. If enabled, you can add text, social icons, or both in a second column to the right of the header logo. If you select Social icons, configure the icons at Customize > General > Social links. See the Related Article about the Customizer General tab for more information. 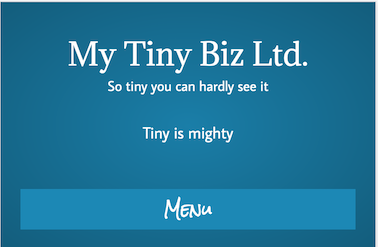 You can add your site's tagline below the header logo text. 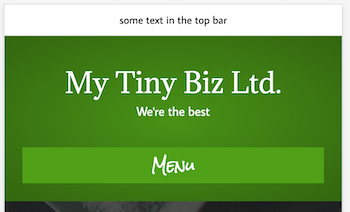 See this article on how to add the site tagline to your header. The Nav area can be configured separately on the Nav Layout and Nav Style tabs. See those sections for details. You can check the layout at the three device sizes by clicking one of the WordPress device view icons at the bottom of the Customizer panel. Menu items appear to the right or left of the header logo respectively. Here's a screenshot of a Nav Right layout with the site tagline enabled. Here's the same Nav Right layout on medium devices, without any custom modifications. You can see that the layout has automatically shifted to a Nav Centered layout. And here's the default mobile layout with the same settings. Either the Menu button or the hamburger icon will appear, depending on which Nav layout option you choose. Menu items appear below the header. Both menu and header logo are centered. The following screenshot is of Nav centered layout on a large screen with the optional site tagline enabled. Here's the same Nav Centered layout on medium devices, without any custom modifications. In this layout the header logo is centered and the menu items straddle the logo text or image, as shown in the following screenshot. Here's the same Nav Centered layout on medium devices, without any custom modifications. You can see that the layout has automatically shifted to a Nav Centered layout. When there are an odd number of menu items, should the logo appear to the right or the left of the middle item? In the large-screen screenshot above, the setting is Right. You can check the layout at the three device sizes by clicking one of the WordPress device view icons at the bottom of the Customizer panel.There is one other setting for this layout choice. Inline logo position: When there are an odd number of menu items, should the logo appear to the right or the left of the middle item? In the screenshot, the setting is Right. Header and menu items appear in a vertical bar along the left or right side of the page in the header background color, with fixed layout (doesn't scroll with the content to the right). You can customize settings for the width and padding of the left or right bar. Tip: The header logo is sized according to the amount of space in the vertical bar. If the logo appears too small, decrease the Padding setting first, then try increasing the Vertical nav width setting. As screen width is sized smaller, menu items appear centered below the header, then as the width is reduced even more, menu items are replaced by the word MENU or a hamburger icon, depending on which Nav layout option you choose. You can set text color, link color, and hover color. These color settings apply to the two parts of the header logo area that can contain text: the header logo if you choose text instead of an image; and the Content layout area in the Nav bottom layout. Note that the hover color also styles the current page item in the menu. Choose Text or Image as the logo type. 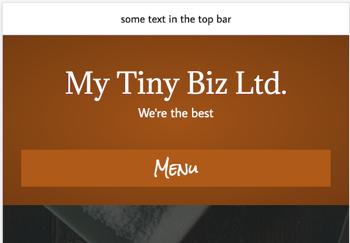 For text as the logo type, you can choose font family, font weight, and font size. Text and link color are determined by the settings in the Customize > Header > Header Style section. For image logos, you can add both a standard and high-DPI (retina) version. 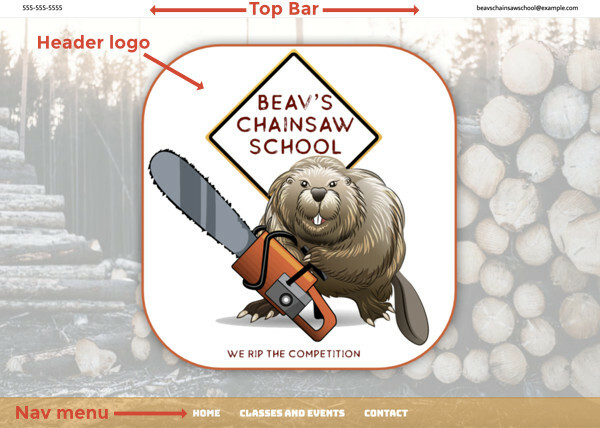 In Beaver Builder Theme Version 1.7, you can set a different header logo image for mobile devices in the Mobile header logo field. By default, the max-width breakpoint for mobile devices is 768px. You can also upload a different standard and Retina logo for Fade In header layouts. For example, you might want to upload a smaller or shorter version of the logo that will fit in the narrow upper band. After you've uploaded the logo, make sure you've selected the Fade In type of fixed header in Customize > Header > Header layout. On the Nav Layout tab, you can control the following aspects of the nav menu in the header. Set the number of pixels between menu items. Choose whether or not to display a WordPress search icon. By default, WordPress searches only Post titles and Post content. Choose the Menu button or Hamburger icon to appear when the screen width goes below the Responsive nav breakpoint (customized further down). 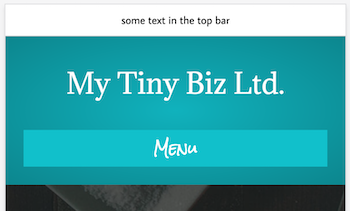 If you choose the MENU button for the Responsive nav toggle, you can enter a custom label instead of MENU. Note: The default breakpoints are 992px for medium screens and 768px for small screens. You can change these defaults in the Beaver Builder plugin's Global Settings. You can choose one of the animated flyout settings or the standard menu dropdown to appear when you click the Hamburger icon or Menu button. For more information about each choice, see the Related Article below on flyout animations. Choose whether the flyout menu appears to the left or right. This setting applies to the case in which you have a submenu of a submenu -- in other words, multiple levels of submenus. 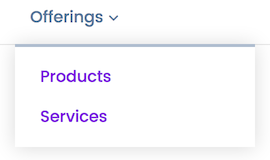 When the setting is Disabled, clicking a top-level menu item opens all descendants with one click when the Hamburger icon or Menu button is in use. When the setting is Enabled, you must click each level to display the next level of submenu. Choose No to allow more than one submeu to be open at the same time when the Hamburger icon or Menu button is in use. Choose Yes to automatically hide a submenu when another submenu is opened. The Nav style tab has the following settings. You can enable a Font Awesome down arrow icon to main menu items that have submenus, as in this screenshot. When the header layout puts the menu below the header logo area ( Nav Centered or Nav Bottom), you can select a background color or image for the menu bar plus nav text color. Note: Some nav layouts like Nav right turn into a Nav centered layout as the screen is sized smaller, but in this case the nav bar cannot be styled in Customizer for the smaller devices. You'll have to write your own customization. You can set the font family, weight, format, and size specifically for the navigation menu.